Assessing the regional blood flow within the lung potentially helps to identify and treat pulmonary diseases and might support mechanical ventilation. Especially for guiding mechanical ventilation, bedside monitoring of both regional ventilation and pulmonary perfusion is desirable. Electrical Impedance Tomography (EIT) is a non- invasive imaging modality providing functional images of relative impedance changes induced by regional ventilation and blood volume changes, so-called cardiac induced impedance changes. 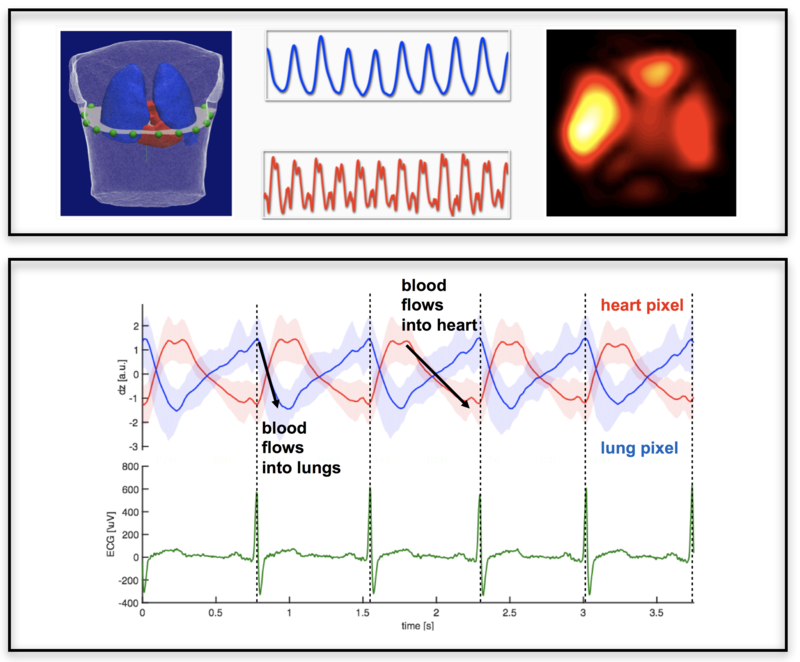 In this project, new signal processing methods shall be developed and implemented to further investigate pulmonary perfusion by means of the Electrical Impedance Tomography (EIT). The work includes the reconstruction of the EIT measurements to visualize cardiac related conductivity changes within the body and signal processing to understand, visualize and improve clinical and physiological hemodynamic parameters. M. Kircher, A. Braune, T. Bluth, M. Gama de Abreu, O. Dössel, and B. Stender. Method for comparing pulmonary perfusion measured by PET/CT and indicator based EIT measurements in a porcine model.